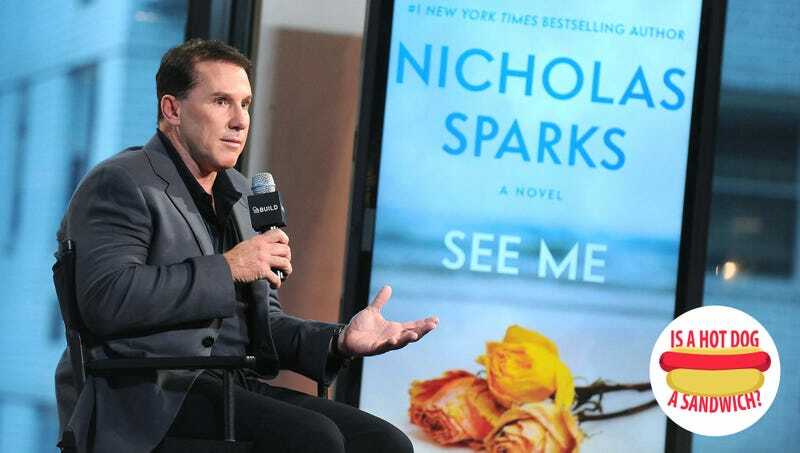 To call Nicholas Sparks a man of few words would be laughable. The prolific author of The Notebook, Message In A Bottle, A Walk To Remember, The Longest Ride, and other tearjerkers has a seemingly endless font of words at his disposal. Hell, he’s got a book out next month, and we didn’t even know about that when we decided we should ask him if a hot dog is a sandwich. No, that occasion arose because of Sparks’ involvement in The Great American Read, the PBS series that aims to find America’s most beloved book (see: Meredith Vieira). One of his is in contention—The Notebook, which is the Rachel-McAdams-and-Ryan-Gosling-makin’-out-in-the-rain one. But as a lover of words and books in general, his presence is the series is no surprise. Other publications will ask him what it’s like to see one of his titles on PBS’s list of 100, what inspired his next romance, how it it feels to write stories of love (and other things) in such a chaotic time. We’ll ask him and sandwich taxonomy. Nicholas Sparks is not a man of few words, but for this one question, he was. TO: I write for a food publication, and we’re asking a bunch of people if they consider a hot dog to be a part of the sandwich family. NS: Is a hot dog a sandwich? [A long pause.] I’m going to say… Yes. Yes. With that, he turned, striding away with a comfortable ease, like a man who knew he’d answered as best he could, answered a question he’d never expected with honesty, with decision. He stepped from the room into the California sun, which shone down on his broad shoulders in their gray blazer, and I knew then, with perfect clarity, that I would never forget the sight. He did not turn back, but walked on, leaving behind a woman, and a small recording device, and a word, repeated again and again in my mind: Yes. Yes. Yes. And then he was gone.